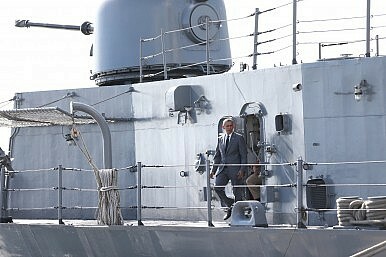 Former U.S. President Barack Obama tours the BRP Gregorio Del Pilar. Last week, a Philippine Navy (PN) official suggested that a warship damaged last year would likely be available for operations again before the end of 2019. The latest update put the focus on how the PN is dealing with the fallout from the damaged vessel and when we are likely to see its return. As I have noted before in these pages, the Philippines, which has traditionally had one of the weakest navies in the region, has been looking to boost its naval capabilities over the past few years. But though that trend that has continued on into the administration of President Rodrigo Duterte, that process has continued to see its fair share of challenges as well. One of the unexpected challenges that had confronted the PN last year was the fact that the BRP Gregorio Del Pilar, one of the three Hamilton-class cutters acquired by it from the United States, had run aground off Half Moon Shoal in August. The vessel was finally recovered and towed back to port, and questions have remained about when it might fully return online. Initial indications in September following inspections were that there would have to be a replacement of two propellers and repairs conducted on bottom appendages. At the time, Philippine officials had also said that there would be some additional communications and weapon and fire control upgrades conducted as well to optimize the vessel’s downtime period. Last week, we received further updated information about the vessel’s status. The warship is currently expected to be available for operations before the end of 2019, Vice Admiral Robert Empedrad told the Philippines News Agency during a chance interview according to a report published on January 9. Empedrad confirmed that the key issue was the damage sustained by the ship’s two propellers, which required total replacement. The pace of the replacement work would partly be determined by the availability of propellers to address that aspect of the damage, and they would have to be gotten from the United States. Empedrad added that while the Philippines waits for the warship to come back online, other vessels including her two sister ships, the BRP Ramon Alcaraz and BRP Andres Bonifacio, were carrying out some of the duties that it had done previously. In addition, he expressed hope that the potential addition of new vessels in the coming months, including from South Korea, would help alleviate some of the additional stress that dame from the warship’s damage while its recovery is being dealt with. The second of the Indonesia-made vessels finally arrived in Manila, completing a deal that had been rocked by a corruption scandal.